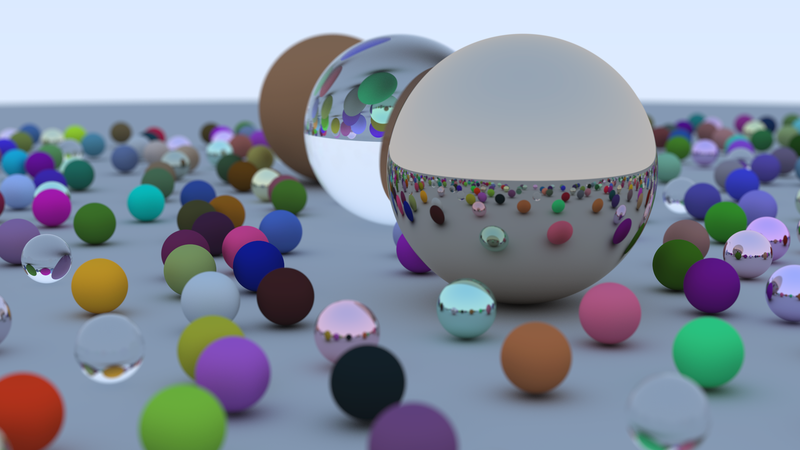 I’ve been entertaining the idea of writing a ray tracer for a while now and last weekend I stumbled across the excellent book “Ray Tracing in One Weekend” by Peter Shirley. I really enjoyed the read and had even more fun following along and implementing it. I dismissed Peter’s advise to write it in C++ and instead did a Cython implementation. The total implementation is 575 SLOC (excluding whitespace). I won’t go into all the details of writing the ray tracer (if you are interested, read the book—it’s really accessible and it is only 49 pages). I will however say that after writing the code, it was also interesting to profile the code and find the places where small syntax changes made huge differences in runtime. When a function is executed many millions of times, even small alterations make a big difference. That said, this is still plenty of room for improvement. My implementation is on github here.